but especially to those in the military. Nothing stirs my heart more than uplifting stories by Patriotic Americans. History has so much to teach us, and as Americans, we have an incredible and unique heritage from which to draw inspiration. From Plymouth Plantation to Paul Revere's Ride, from Concord to Charleston, from Saratoga to Gettysburg the early "Rebels" fought bravely to gain their independence from Britain. Finally, in 1781, the British General Cornwallis surrendered to the young General Washington. This is just the beginning of our nation's eloquent history, and the birth of our fighting force. I am a Warrior and member of a team. Who am I? Your father, uncle, grampa, brother, son ... your sister, mother, grandma, aunt, daughter! 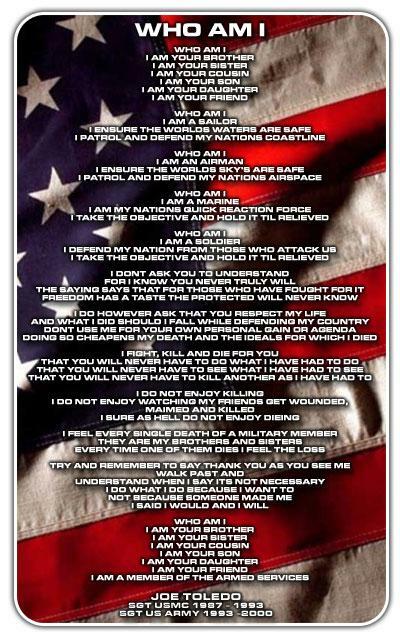 Honorably discharged Vets are all around us. They did their time, served well, and then grew their families and careers. Though the details are different from war to war, from conflict to conflict, there is an intangible bond between all who have served in harm's way. There are plenty of rumors of mistreatment of our vets in the media, yet seldom do we read about the thousands who return from military action and lead productive, healthy lives. As usual, it is only the unhappy incidents that make the news. While this is true, HOMELESSNESS among VETS, for example, is outrageously beyond the average. Medical professionals can readily diagnose physical injuries, but mental or emotional injuries can much harder to see, and occasionally, take years to fully manifest. Post Traumatic Stress Disorder (PTSD) is present in varying degrees and manifestations in just about ALL Vets that have served in combat. The Veterens Administration (VA) does a wonderful service to our vets. There are any number of services available from their website. In my opinion, NOTHING is too good for these brave women and men. No one LIKES war. No one wants to die. Many times, war can be avoided by skillful negotiation. There are occasions, however, when the open cruelty of a seated government to its people goes beyond diplomacy. There are occasions brought about by instances like 9/11 that require ACTION. Is it OUR war? Ahhh ... the age-old question: Am I my brother's keeper? It's all a matter of perspective! If you're a big, strong man walking down the street, and you chance upon a bully beating up on a weak, old man or small child, are you going to walk on by? No, it's not up to the USA to "police" the world. However, as the richest and strongest kid in the "neighborhood," should it not be our responsibility to come to the assistance of the various people of the neighborhood that request help? Yes, in Iraq? Yes, in Somalia ... and every place where bloodthirsty tyrants impose their will upon a voiceless people. Should every nation be governed democratically? Not my question to answer. But human rights ... the right of each human to make a life for her or himself ... that is worth fighting for. Our Constitution says there are certain "rights" that are "inalienable ... from our Creator." We either believe that or we don't, but that is what it says! Should our mission in Iraq "&" Afghanistan be clarified? YES!!! Furthermore, the politicians are elected to make policy. Let them do so and then release the military to DO the job! TODAY is what matters ... and those fighting today matter. If one listens to the flurry of opinions from left to right, there is so much hate, so much distrust, so much anger ... And this is WITH free education for all! Iraq and her neighbors have lived in the shadows of abusive dictators for centuries. Can we, the American people, honestly expect them to embrace freedom and become fully functional in a matter of months? Most Americans don't understand FREEDOM's depth and breadth and many of us grew up knowing and exercising our rights more fully than we can today. It's way past time for WE THE PEOPLE, the American public, to demonstrate our resolve ... the resolve we felt on 9/12 ... the resolve that caused us to break from Britain, the resolve that caused us to fight to eliminate slavery. We must resolve to believe the BEST of our troops in harm's way over the sensationalistic journalism of the media. We must resolve to become active members of our local community and sit complacently in an "isolationist" mentality. Find ways to get involved. We must educate ourselves on those seeking office, and VOTE our conscience!!!!! We cannot rely on others to govern and rule well if we do not do our part. It's been almost 10 years since 9/11. President Bush said this war effort would challenge our resolve, and it surely has. How can we consider packing up and coming home when unrest threatens to explode into further violence throughout the Middle East, and so many have laid down their lives in the effort to offer a chance for FREEDOM where there has been none. Yet, politicians bind the hands of our service members with unrealistic terms of engagement that prohibit any kind of "victory" either in Iraq or Afghanistan. We must remember ... We must resolve to remember! My 21 yr old daughter is among those who serve. Like her dad and me before her, she is now serving abroad. She has already spent a year in the desert of Kuwait. Although I miss her like crazy, she and I both know this is her life, her choice, and the path she is destined to walk. I am more proud than words can say, but I also wish her safety and peace of mind as she grows and serves. There are many ways those of us back "home" can support out troops. There is no end of organizations on the national or local level which are designed to meet the needs of our deployed military women and men. Below, I enumerate a few of them with a brief description of their mission. Perhaps there is one that excites your interest! War is not just about winning and losing or numbers of deaths. It's about people living and dying for something they believe in. Thousands are coming home permanently changed. It is not something we read about often. Just in my few minutes of misc searching this morning, though, I have found some great efforts in support of our wounded servicewomen and men. These are heroes - unwilling, perhaps, but still they have joined the ranks of those who have sacrificed themselves in support of our nation. Beyond a doubt, they should receive the BEST medical and remedial care available. Support also should be available for the families of those in rehab or recovering from their wounds. Much of this support, comes in the way of volunteer organizations like the ones below. Check them out. It doesn't cost anything to read, and maybe your heart will be touched also. Here are some ... just a few ... of the organizations that help our wounded and returning service women and men. 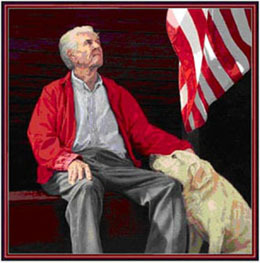 There are 18 veterans in the United States that commit suicide everyday and one (1) shelter animal is put down every eight seconds � P2V�s, (or Pets2Vets), work helps facilitate the healing and support for the 10-12 million men and women who suffer with some form of psychological condition and homes for the four-five million sheltered animals who are euthanized every year so that both may live in dignity as they embark on their journey together. P2V provides our nation�s heroes a choice in selecting an animal of their choice, while providing cost-effective animal assisted activities (animal companionship) as they pursue rehabilitative and therapeutic care from their health care providers. Tens of thousands of American Service Members are deployed in hostile and remote regions of the world, including the Middle East, Afghanistan, and on ships throughout international waters. The physical conditions they must endure are difficult and they may be separated from loved ones for long periods of time. Operation Gratitude is a 501(c)(3) non-profit, volunteer-based corporation, funded entirely by private donations. For safety and security, the assembling of all packages occurs at the Army National Guard Armory in Van Nuys, California. 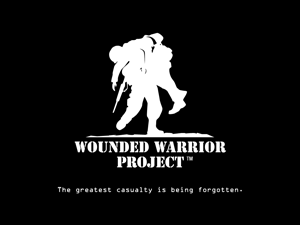 The mission of Wounded Warrior Project is to honor and empower wounded warriors. Wounded Warrior Project (WWP) began when several veterans and friends, moved by stories of the first wounded service members returning home from Afghanistan and Iraq, took action to help others in need. What started as a program to provide comfort items to wounded service members has grown into a complete rehabilitative effort to assist warriors as they recover and transition back to civilian life. As we carry out the Wounded Warrior Project mission of honoring and empowering wounded warriors, our innovative programs and outreach efforts continue to expand. To help you - wounded warriors, family members and the general public - navigate our offerings, we have categorized our programming under four main focus areas - Mind, Body, Economic Empowerment, and Engagement. Under each of these headings, you will find a variety of programs to meet needs ranging from benefit assistance to PTSD identification. Our Goal is to involve All Americans to assist in rebuilding the shattered lives of our WOUNDED HEROES who have sacrificed so much fighting for our Freedom. American War Heroes is a 501 (c) 3 non-profit organization consisting of business leaders, professional athletes, entertainers, corporations, individual donors and American War Hero Members dedicated to providing Emotional, Career, and especially Financial Support to our American Military Personnel who have been injured fighting the war on terrorism. The purpose of the Thank You Foundation is to implement and administer programs designed to carry out a mission of appreciation for our service members and their families. The Thank You Foundation is still in its infancy and may lack some of the resources and connections available to larger nonprofit organizations. However it has been able to make an impact on thousands of lives and continues to make great strides at helping to improve the quality of life our nation's heroes. The strength in the organization is that it can often react more quickly than most government institutions and can be more flexible within its mission to help fulfill a need. Since the Foundation works so closely with unit Commanders, Family Readiness Leaders, and with Veterans Service Organizations it can often act as a conduit for helping to connect resources while providing services of its own. 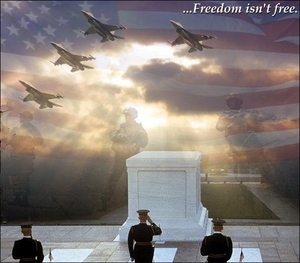 FREEDOM IS NOT FREE is an a-political, non-partisan, non-profit organization that labors under the mission "Aiding wounded troops, their families and the families of the fatally wounded." Despite the assistance and aid offered by the military and the government, wounded military personnel and their families confront innumerable obstacles while coping with the burden of care for a wounded service-member or the loss of a loved one while in the service of our country. FREEDOM IS NOT FREE will donate 100% of the money raised to organizations and programs that meet the needs of our heroes and their families. 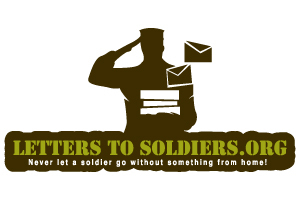 With the help of volunteers across the US and the world who write letters, make cards and banners and hand made items to send our brave and selfless deployed military men and women, we hope to show them that we have not forgotten their great sacrifices for us by shipping special care packages to them. We also collect support from the community for their families while they hold down the fort at home. 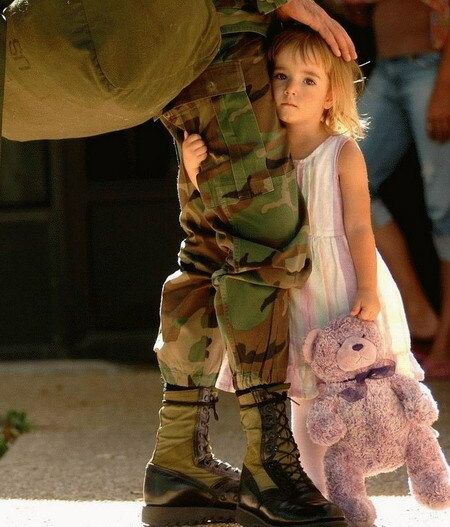 Military Families United: Honor. Support. Serve. Military Families United is a not-for-profit 501(c)(3) charitable organization whose mission is to Honor the Fallen, Support Those Who Fight, and Serve Their Families. We are a national coalition of Gold Star and Blue Star families, veterans, and patriotic Americans who share a deep appreciation for our men and women in uniform and support them in their mission to keep America safe. Founded in 2005 to provide an avenue for military families to remind the nation of the importance of supporting our military and the mission they had been given to accomplish, we expanded to provide charitable programs that offer families direct support. Through a portfolio of unique services, events, and advocacy programs, we seek to ensure that future generations of Americans will never forget the sacrifices of our courageous military and that these men and women and their families receive the support they need. National Military Appreciation Month (NMAM), as designated by Congress, provides a period encompassing both the history and recognition of our armed services with an in-depth look at the diversity of its individuals and achievements. It allows Americans to educate each generation on the historical impact of our military through the participation of the community with those who serve encouraging patriotism and love for America. National Military Appreciation Month (May 2007) includes Loyalty Day (1st), VE Day(8th), Military Spouse Day (11th), Armed Forces Day (19th), and Memorial Day (28th). 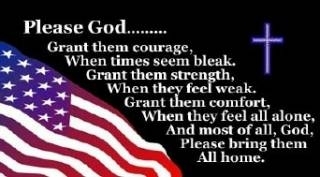 This very important month honors, remembers, recognizes and appreciates all military personnel; those men and women who have served throughout our history and all who now serve in uniform and their families as well as those Americans who have given their lives in defense of our freedoms we all enjoy today. 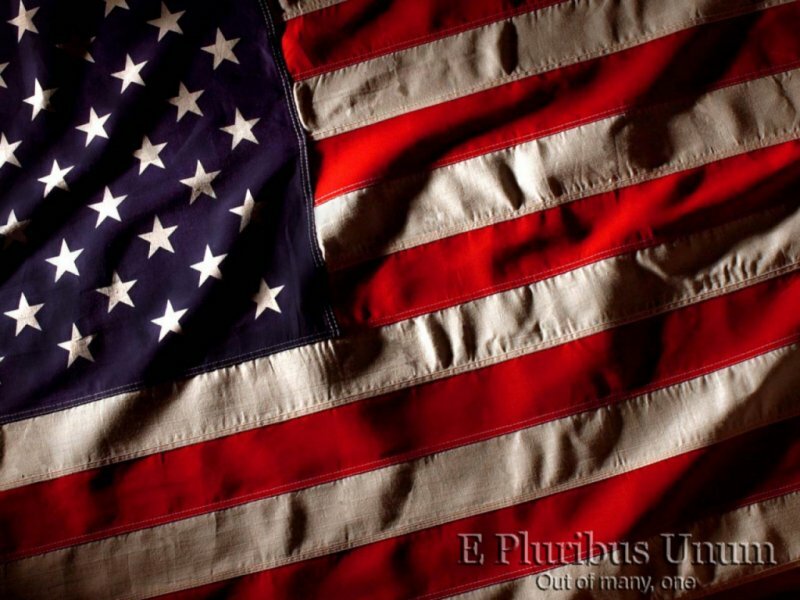 Thank you ... those who have served and those who share your loved ones for this noble purpose.